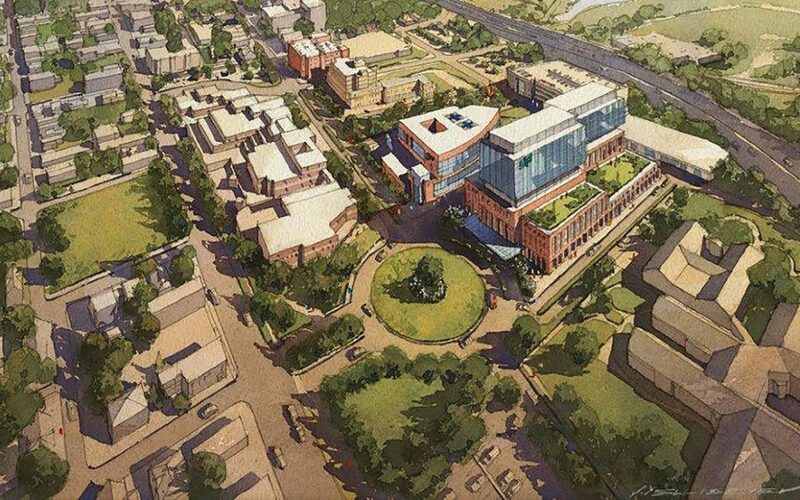 One of the most intriguing pieces of MetroHealth’s ambitious campus transformation plan — a nearly $1 billion project that will physically remake the system as we know it — is the community tie-in. The bulk of Cleveland’s major construction efforts have at least some component to source local talent for construction jobs, but MetroHealth’s plans take that approach to the next level. And, of course, all of the local hospital systems have committed dollars in some regard to uplifting their surrounding neighborhoods, but none yet has taken it to quite the level that MetroHealth intends. The health system’s board in late July approved the creation of CCH Development Corp., a nonprofit devoted to revitalizing its West 25th Street neighborhood and developing nearby abandoned real estate in collaboration with various other partners. And while it’s a unique model among Northeast Ohio hospitals, it’s not completely foreign to the region’s major institutions. Both Cleveland State University and Playhouse Square launched development entities — with success — focused on uplifting their neighborhoods. While we believe the region’s health systems should play an active role in uplifting the relatively poor locales they call home, none bears a greater responsibility than MetroHealth, which receives a modest, but critical, subsidy from Cuyahoga County taxpayers. Taxpayer dollars should come with clear expectations for community benefit, and no publicly funded institution in Cleveland appears to be setting the bar higher than MetroHealth. This was taken from this source article in Crain’s.